I generated some interesting images for a publication Heidi is working on yesterday, and thought they'd be worth sharing. I took 10,000 external IP addresses of active hosts, did a GeoIP lookup for their lat/long and then plotted them using google maps. 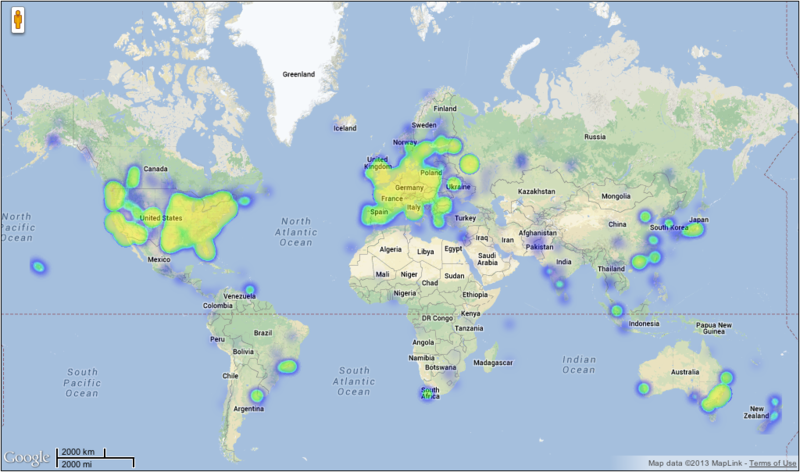 The first is a set of points, and the second is a heatmap (generated with heatmap.js). Message 59004 - Posted: 20 Jun 2013, 21:42:25 UTC - in response to Message 59002. I'm in that blue blob on the east coast of the USA and have been for quite some time. I used to be in a different blob...sigh. That was my birth blob. I've been away from my birth blob since I got smart-my diploma says I am. I went to a "better" blob after that for 40 years. Travis, it looks like you have a cluster of fans in the US and Europe, but the penguins on the ice down south clearly have no interest. Perhaps a few astronomy classes for the birds may be in order. One must always look for the "next" thing to accomplish :) In any event you've done well. Considering their absurd population, I really don't feel that India is pulling their weight. Excellent, Travis. Thanks! Very cool to see blue in Iceland, the northern reaches of Scandinavia, Mauritius (or Reunion? ), Sri Lanka, Tasmania. Awesome. I believe I'm the southernmost dot in Chile. Message 59073 - Posted: 24 Jun 2013, 11:59:40 UTC - in response to Message 59044. 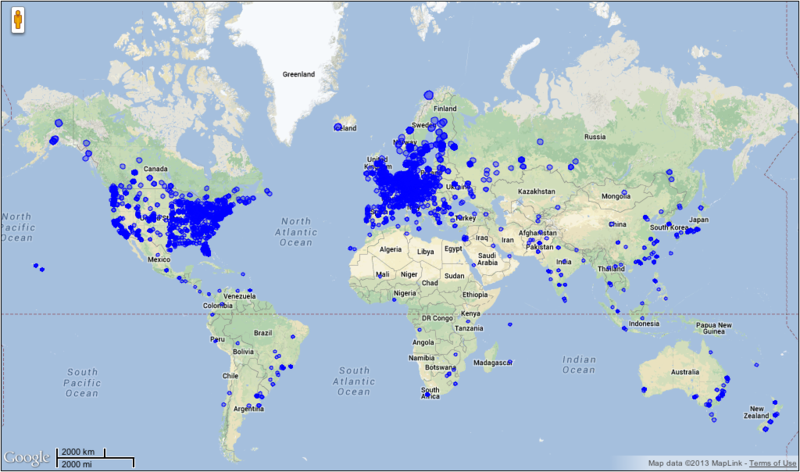 I believe the map is of 10,000 randomly-selected users who have recently returned results. Message 59125 - Posted: 26 Jun 2013, 20:39:03 UTC - in response to Message 59044. So the maps aren't exhaustive by any means.